Books and Quilts: Tangled Thursday - Today, the Journey Begins Challenge. Tangled Thursday - Today, the Journey Begins Challenge. I am a bit quite a bit late today with my post today. Honest, I have a good reason. About two months ago I messed up my knee at fencing, too many deep lunges, and have been going to physio. Today I was in the midst of editing my photos for my post and remembered that I wanted to take some recipes and a snack to the one of the staff members at that office. By the time I was finished, it was time to leave. The reason I wanted to mention the physio is that i have been working very diligently at doing my exercises and have seen dramatic improvements in the past month. My knee is so much better that I am almost at the point I can run up stairs. Believe it or not, my tangling works the same way. When I don't pick up a pen for a while, I kinda lose the knack and need to do some refreshers. Whereas, when I draw most every day, it keeps everything fresh in my mind and I can start right in on the good paper. Frequent tangling really does make a difference. Not that I expect that I will go on a streak and tangle for a specified time every single day without break, but drawing once a week, just before I write this post, is not working for me either. Since I enjoy it, I should be drawing more often and perhaps I'll see results such as those I'm seeing with my physio. This week's challenge was posed by Tami. (you can view the drawing at her blog) She sent us each the link to an image with the words "Today, the journey begins...". Like me, she has children finishing school and to further challenges. I've been working away at mine for a few days and it still needs some additional tangling, but here's what I have so far. i packed lots of imagery into this drawing. The footprints, getting larger represent childhood to adulthood. i used Diva Dance inside as my daughter is something of a diva at time and it really does suit her personality. In the rainbow, starting at the bottom: AAs' and Chemystry to represent schooling, Moving Day for all the moves she's yet to make in life, Heartrope speaks for it's self, Paris for the travels past and future, Knitting for the various hobbies she will enjoy through her life, Lace Curtains for the various households she'll establish and the homes they will become. Since a little rain falls in all our lives, I've added Rain as drops (a few more yet to be added). And I have yet to add Warts &Wobble at the top of the rainbow, because we all know that life is full of both of those. At the base of the rainbow, no bucket of gold coins, rather I'll be adding Intersection. a few others might sneak in before I'm finished. I'll post the finished drawing next week on Thursday. Welcome to Tangled Thursday. A few of my local and online friends have joined me in an occasional Zentangle challenge. We'll take turns choosing a theme and them post our drawings in about 2 weeks time. All are welcome to join in the fun. If you are new to Zentangles, then visit the website for a complete explanation and all sorts of online resources. I'm also a big fan of TanglePatterns.com. This week's drawing required a lot of thought and pre-planning. Finding the right tangles to use took the longest. There are so many tangles available, but I wanted the right feelings. Most of them are new to me. I did use my pencil a few times to draw my arcs and the feet. I added Rain late in the process as I couldn't figure out how to use it. It was going to be an arc but that didn't seem right, that would be as though it was raining all the time, I just wanted drops here and there. I needed to audition for the start of the rainbow, while Auraknot is pretty, it really didn't have a message, while Intersection represents the various crossroads and decisions daughter will have to make yet. I am also submitting this for the Diva's Weekly Challenge 168. We are to use Rain any way we chose. I participated for the first time last week and found it very helpful to view all the other submissions, over 90.
updated image. I have added more rain that has fallen through the rainbow and been changed. I think they are now more open and inviting. Like one of those gentle rains that sends children outside to dance in the drops. Here's my question, when you participate in a meme or challenge, do you go and view/visit all the other submissions and do you comment? I viewed them all and left comments at most of them. I can't do that every week. Is there an online meme/challenge protocol? 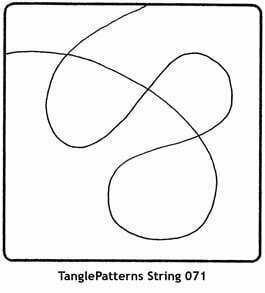 Tangled Thursday's new challenge is to start with String 71 from Tanglepatterns.com and draw. Use what ever tangles you wish, and whatever surface works for you. Have fun and post your drawings on your blog and link back here on Thursday, May 29. Fantastic! I love that you took the time to find patterns that have a connection to your daughter. Very nice job! I completely agree about needing to draw a bit every day to stay in the "groove". I tend to hop from thing to thing and when I've been away from the pen for too long, it's like starting over. I never look at other entries until I finished mine. And I do comment all every week because I believe that everyone likes to get a comment. And I will not take the risk of only commenting the (in my opinion) best ones. Your piece is great it's wonderful to see all the prep work and share your tangling process with us. Glad your on the mend! I like the way you used Rain in pieces and how you embedded one in the middle of other tangles. Your ZIA is lovely!